Now that spring is in full swing, it’s time to take the cover off of your mower and get to work. Here are a few tips to help you get the professional lawn maintenance look without the professional price tag. When the weather warms up, it is tempting to head straight to the garage and crank up your mower for a little ride around the yard. However, before getting the mower ready, start with a little clean up around the yard first. Take a little time to rake up any leaves and sticks that may have blown in from storms or fallen after you did your last clean up at the end of fall. It is also a good idea to make sure there are no toys or other items around that could be hazardous when mowing. Raking the lawn will also help you find any areas of the lawn that may need to be treated or need special attention. In addition to cleaning up your lawn, it is also a good idea to give your mower a little attention as well. Just like your vehicle, you want to clean the outside and then check all of the other parts before giving it a go. You can clean the mower deck, grease any fittings, and check the tire pressure for starters. Small maintenance now will keep your mower in good shape and will help it last much longer. Every type of grass is different and there are a lot of opinions out there about when to begin mowing your grass in the spring. However, no matter what type of grass you have, one of the best things to do is to make sure that your grass has had time to begin sprouting and growing. Once your grass is green, growing, and ready for the lawn mowing season, follow the simple “one-third rule”. What is the one-third rule? This means that instead of creating a mowing schedule that is based on mowing your lawn on a particular day of the week, you only mow when needed and you never remove more than one-third of the blade of grass. Download our Spartan Mowing Guide to learn more about mowing, fertilizing, and getting rid of weeds. Most people believe that they must remove grass clippings from their lawn. Others remove clippings to make their lawn look cleaner. However, allowing your clippings to stay on the lawn can actually be beneficial. Clippings can help your lawn retain moisture and create needed nutrients as the clippings decompose. However, if the clippings are too thick or not decomposing fast enough, it is a good idea to remove them so that they do not suffocate the growing grass below. Following these tips will help you get started with creating a pro look for your lawn. However, choosing the right equipment is another big step. With Spartan Mowers, it has never been easier to get the right mower to create a professional lawn for a great price. The Spartan RZ Series is the perfect example of a residential mower with a residential mowing price tag that gives commercial grade mowing performance. This series comes with the Spartan standard features that many have come to love such as the GT Trac, easy touch brake system, ergonomic cockpit, and so much more to give you a quality cut, ride, and design at a fraction of what the competition charges. Check out the Spartan RZ Series and the other mowers in the Spartan line-up at spartanmowers.com. 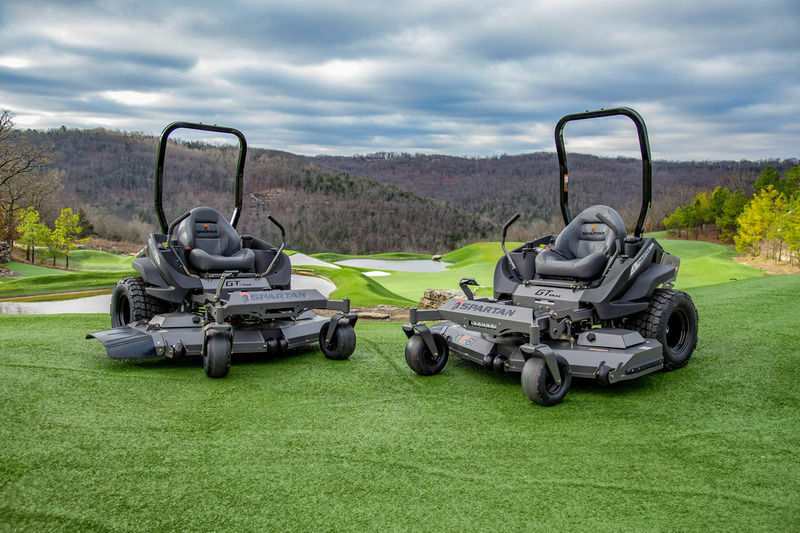 You can also see why Spartan Mowers are making an impact on the mowing industry by visiting a DEALER near you to see a Spartan up close and in person. Check out our DEALER LOCATOR to find a Spartan Dealer near you. Remember, if it’s not a Spartan, it’s not the best.